If you've had it with your inefficient, inconvenient cooling and heating system, maybe it's time to think about an entirely new approach to household comfort. A Zoned Comfort Solution™ incorporating ductless technology offers both cooling and heating in a streamlined, energy-efficient way that might just solve your comfort woes. It’s astonishing: Technology has revolutionized so many aspects of day-to-day life over the past 50 years, yet home air conditioning systems haven’t changed much at all. Walk into any American home in 2016, and you’re likely to find the same type of central system that probably kept the home comfortable decades earlier. Despite its long run as the dominant mode of indoor climate control, central or forced air has never been perfect—far from it. The main drawback? Ductwork. For homeowners, the only thing more frustrating than those bulky, rigid metal or flexible ducts that hog otherwise usable space is the fact that ductwork tends to leak, often severely enough to compromise overall system efficiency by 20 percent or more. That means, in order to make up for the energy loss, the cooling and heating system must work harder and longer to maintain the target indoor temperature. Homeowners, meanwhile, pay the price for the extra energy consumed because of the system’s imperfect design. No wonder people often complain that it costs a small fortune to cool and heat their home. The good news is that it doesn’t have to be that way anymore. Today’s homeowner can choose from an array of exciting, next-generation climate-control options, many of which eliminate ductwork and deliver unsurpassed efficiency. Of them all, Mitsubishi Electric Cooling & Heating (Mitsubishi Electric) stands out in a class of its own, with a technology that combines energy-smart design with customizable options. Mitsubishi Electric offers the best of both worlds. In the realm of energy efficiency, a Zoned Comfort Solution can save homeowners up to 30 percent or more on monthly utility bills in comparison with traditional forced-air systems. As for household comfort, a system provides an unprecedented high degree of control, enabling homeowners to not only conserve energy, but to enjoy a significantly different experience, one that assures total comfort and practically redefines it. Other systems cause homeowners to sacrifice comfort for savings, or savings for comfort. The technology behind a Zoned Comfort Solution, however, entails no sacrifice at all. And word is getting around: Already popular in Europe and Asia, these systems are swiftly gaining converts here. Zoned Comfort Solutions from Mitsubishi Electric take a fundamentally different approach to cooling and heating, and it starts with the basic system design. In contrast with traditional systems, Mitsubishi Electric systems are simple, compact and streamlined. In fact, a Zoned Comfort Solution includes only two major components—an outdoor condenser and an indoor unit (or units). Instead of ducts, a pair of refrigerant pipes narrow enough to fit through a three-inch hole connects the indoor and outdoor units. Whereas the installation of a ducted, central system would entail extensive, time-consuming remodeling, these systems are nonintrusive and, as a result, a great deal easier to put into place. Technicians often complete installation within a single day. Another key point of distinction: Forced-air systems operate intermittently, turning on and off, over and over, in a cycle that consumes a great deal of energy (and makes a lot of noise). Zoned Comfort Solutions, by contrast, conserve energy (and stay quiet) by operating continuously at a low power level. Besides driving up running costs, the stop-and-start operation of forced air systems also results in unpleasant, rollercoaster-like temperature variations. With Zoned Comfort Solutions, it’s a much different story. The technology can accurately monitor the ambient temperature and modulate output based on the demand because the unit is in the space it is conditioning. At the same time, the indoor unit fan ensures controlled, even air distribution throughout the space, preventing any areas from becoming too hot or too cold. That means, no matter where in the room you sit or stand, you always experience the set temperature. Want to switch from cooling mode to heating mode, or vice versa? It takes only the push of a button. 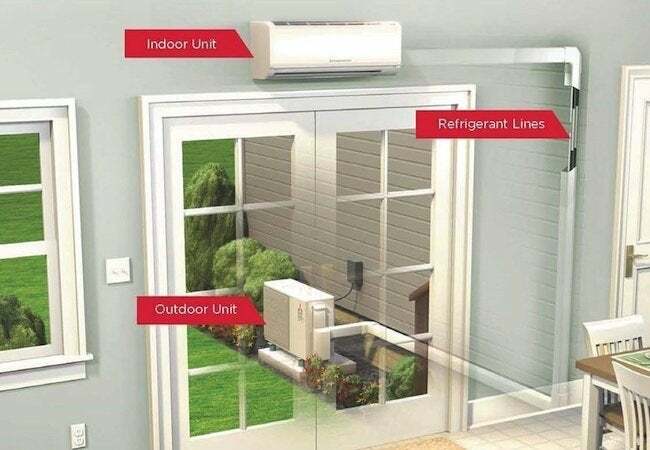 When cooling, the Mitsubishi Electric system collects heat from the home and expels it outside. When heating, the operation reverses and the INVERTER-driven compressor harvests heat from outdoor air and brings it inside. In any season, even at extreme temperatures (down to -13 degrees Fahrenheit), you can rely on a Mitsubishi Electric Zoned Comfort Solution to provide a comfortable and efficient combination. Some homeowners choose to install a Zoned Comfort Solution in one room only—typically, a peripheral space that rarely feels comfortable, such as a sunroom or attic bedroom. More common than ever before is for homeowners to select the Mitsubishi Electric system for whole-home climate control since the system allows you to establish different cooling and heating zones within the home. A zone can be one room, a set of rooms, or an entire floor—you decide. 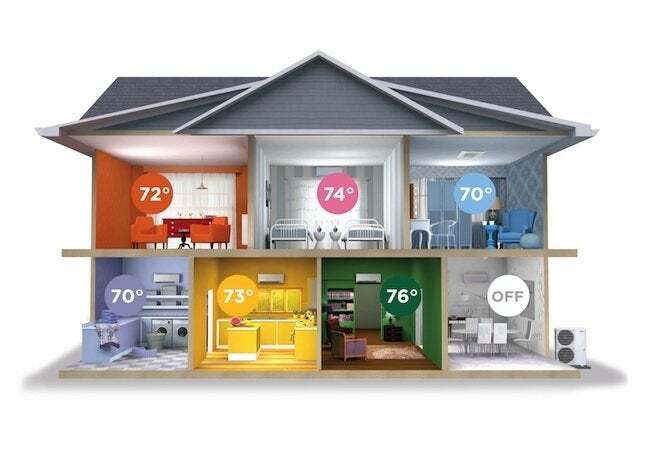 Whatever configuration you choose, each zone gets its own thermostat and can be controlled separately from all the other zones. What does that mean? For one, it means that, finally, family members with different temperature preferences can all be comfortable simultaneously. At last, thanks to the Zoned Comfort Solution, you can put an end to thermostat wars. You can also put an end to wasteful spending on home temperature control. In a single-thermostat home, any adjustment takes effect across the entire house. If you want your bedroom a bit cooler before bedtime, you must pay for the energy consumed to cool not only the bedroom, but every room in the home. Ultimately, all-or-nothing cooling and heating fails to accommodate the reality that different rooms are occupied at different times. By enabling you to target temperatures on a room-by-room basis, zoning ensures that you never again need to pay for cooling or heating an empty room. Empowering homeowners to save even more, Mitsubishi Electric also offers its kumo cloud™ app for temperature control. Available for any iOS, Android, or Fire OS smartphone or tablet, the kumo cloud app enables homeowners to monitor and adjust settings for their Zoned Comfort Solution anytime, anywhere. Are you worried that you left the system on when you ran out of the house? Simply pull out your smartphone to check. Sure, you can always program a Mitsubishi Electric zoned system to run on a set schedule, but mobile control lets you take charge if there’s a change of plan. Are you heading home early? You can turn on the air conditioning before you get there, so your home will be cool and comfortable the moment you walk in the door! 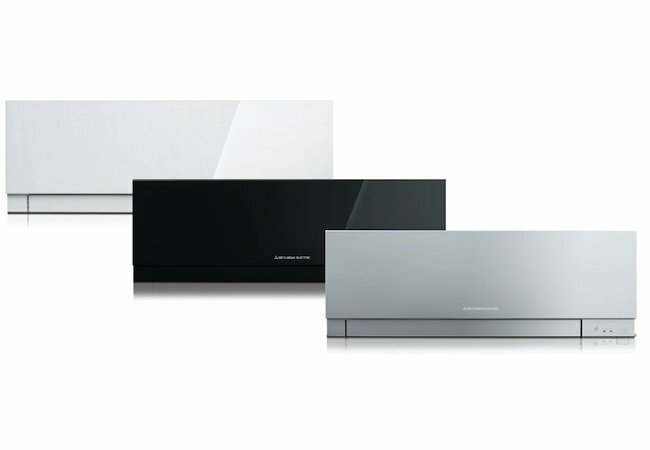 Finally, by its commitment to design, Mitsubishi Electric suggests a new look for cooling and heating. In years past, systems often were anything but eye-catching. 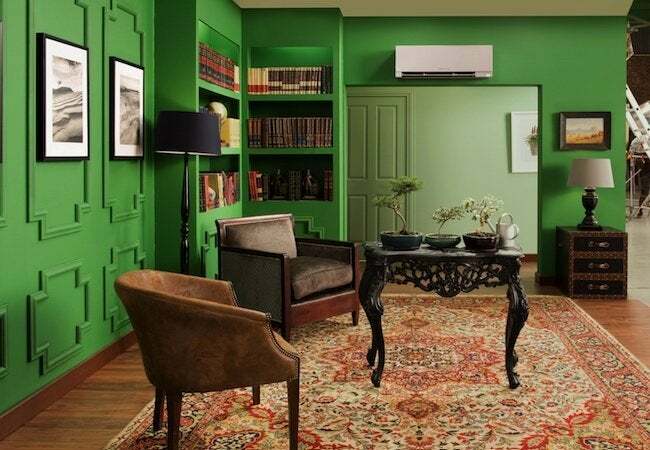 Now, with the release of its brand-new Designer Series, Mitsubishi Electric proves that a climate-control system can be more than a simple utilitarian add-on; it can instead become a sophisticated thread in the fabric of home design. Stand-out performance and sleek aesthetics are not mutually exclusive, after all! Boasting a slim profile, with crisp, beveled edges, and a sharply delineated, rectangular shape, the finely proportioned Designer Series Zoned Comfort Solution comes in a choice of three colors. In light-color interiors, the white model blends in so well that it can almost escape notice. On the other hand, the black finish, meshes best with darker decor, while silver offers a lustrous look, perfectly suited to the clean lines and minimalist sophistication of stylish modern homes—a perfect pairing with stainless steel accents and appliances. The Designer Series makes it easier than ever before to live in harmony with household appliances. In fact, you might even find yourself admiring its aesthetic impact. Cooling and heating isn’t what it used to be, and that’s a good thing. With a system from Mitsubishi Electric, you can experience the most comfortable home climate control of your lifetime, while saving money on utility bills every month. It’s a win-win. And now, with appealing design options and game-changing features like zoning, Mitsubishi Electric’s innovative cooling and heating technology inspire you to view home climate control in a whole new light. In the past, plenty of homeowners have had frustrating, unsatisfying relationships with their space- and energy-wasting systems, but today, with a compact, efficient and customizable Zoned Comfort Solution from Mitsubishi Electric, a much more rewarding option is possible. 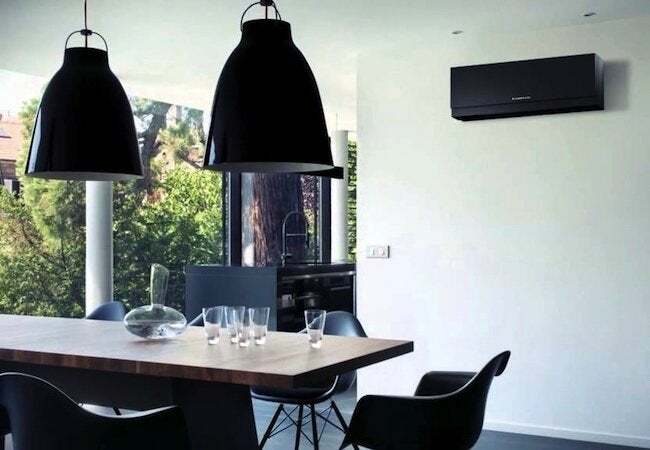 You no longer need to sacrifice your preferences in deference to the whims and limitations of your increasingly outmoded air conditioning system. Zoned Comfort Solutions are designed to meet your needs–not the other way around—and isn’t that the way it should be?